← Today Is The Big Day! Any of our regular taco flavors over fresh fried white corn chips and smoky Monterey Jack sauce, topped with slaw and sided with sour cream and house made guacamole. Yes, you can get fish nachos for $3 more. This is our current menu out at the new spot, it is just about 24 hours old and has been a big hit so far. 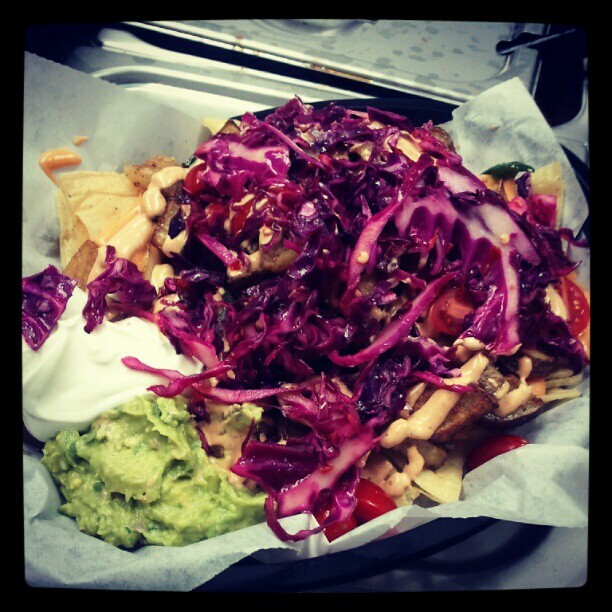 A few have even hinted that we could win some Best Nachos awards. This is how we do nachos. We are open from 5 until 11 tonight, 8410 Hickman. Be there. We will. This entry was posted in Uncategorized and tagged bacon chorizo, best, ceviche, nachos, Slaw, vegan chorizo, wasabi. Bookmark the permalink. Nachos were great. Noticed the higher priced fish taco choices, is that a different deal than the ones you had previously? I ask, because I see they say grilled to order now. Anyway, this stuff works great at that location. Did I mention the nachos were awesome? Yes, they actually cost write a bit more to make, doing the Tilapia in bulk is much more cost effective, especially when we sell out. I think the quality its a little higher also. Cool, I figured as much. Really a good price still. Saw some dude raving about the seared tuna taco. But did you like the nachos? The wasabi on the tuna was fan-friggin-tastic last night. Love the bite of the wasabi with the crunchiness of the slaw. Congrats on the official opening! !